250 years ago a landmark case decided English law didn’t support slave owners, and in 1883, slavery was abolished in the British Empire. The cruelty and injustice of slavery as depicted in films like 12 Years a Slave seems unimaginable today. Why then, in 2015 do we still need Article 4 of the European Convention on Human Rights? Slavery may not look like it used to: the law, and collective public consciousness, do not condone such an overt attack on human dignity. We don’t see the chains. Yet financial profit from human oppression is still common – but happens mostly in secret places, in dark corners. Domestic work, prostitution, and the illegal drug trade are just some of the areas where slavery is alive and kicking. 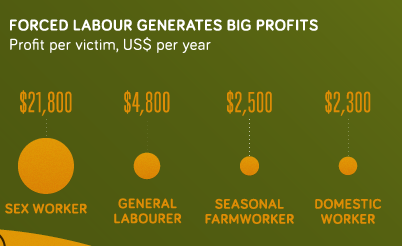 As our infographic shows, there are an estimated 21 million victims of forced labour worldwide. Sadly, the UK is no exception. It is a home to slavery. In a 2011 case, women who had been brought over illegally as children from Nigeria were forced to work in London without pay or breaks, and subjected to abuse. In 2012, a Ugandan woman who had fled sexual violence ended up with her passport and travel documents taken from her by the person who had brought her to the UK. Her movement was restricted to the workplace, and she worked four years without receiving her salary. It was withheld to pay of a debt she knew nothing about. The work was physically demanding and she was essentially on call 24/7. In that case, the UK was heavily criticized for not having a specific law that criminalized forced labour at the time (2007-9). This has now changed, with the enactment of Section 71 of the Coroners and Justice Act 2009, which for the first time expressly outlaws human slavery In 2013, a seminal judgment meant that trafficked children are victims, not criminals. Cases like these led the UK government to pass the Modern Slavery Act 2015. The Act has been criticized for not addressing some key issues , but it is nonetheless significant in the protection it affords to victims of slavery. In short, Article 4 means that we can’t be enslaved or made to work against our will – and this right is ‘absolute’. So enslaving someone is never legal. More than that, suspected slavery and forced labour must be fully investigated. Article 4 is still vital to ensure that we keep up the task of eradicating slavery. It may take a long time yet.